Plum Point marks the entrance to the protected harbor anchorage at Port Washington. Seaplanes drop down out of the sky, trains carry commuters back and forth from Manhattan , and boaters find it the perfect staging location for transit down the East River. Yachts clubs abound, marinas provide expert yacht repair services, dock & dine restaurants feed the hungry, and shoreside shopping and provisioning is just a few steps away. What’s not to like about this easternmost Long Island Sound anchorage at the gateway to New York City? Port Washington at the head of this exquisitely protected harbor was ‘discovered’ in the early 1800s to have fine sand shores, the kind needed to build the skyscrapers springing up in Manhattan. Over the next hundred years, the hills were literally transported out, but not before the likes of the Guggenheims built their estates. Today, Port Washington is a thriving and exciting destination on Long Island's Gold Coast. Click for larger view. For planning only. Not for navigation. From NOAA Chart 12364. Near the 142 foot high Throgs Neck Bridge terminus of Long Island Sound, Manhasset Bay offers a protected anchorage with easy access to the East River . 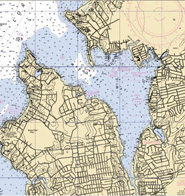 Although Little Neck Bay is a bit closer, all of that Bay, which is home to the Merchant Marine Academy, is a restricted anchorage with 8 feet MLW depth, and there are boulders close to shore. 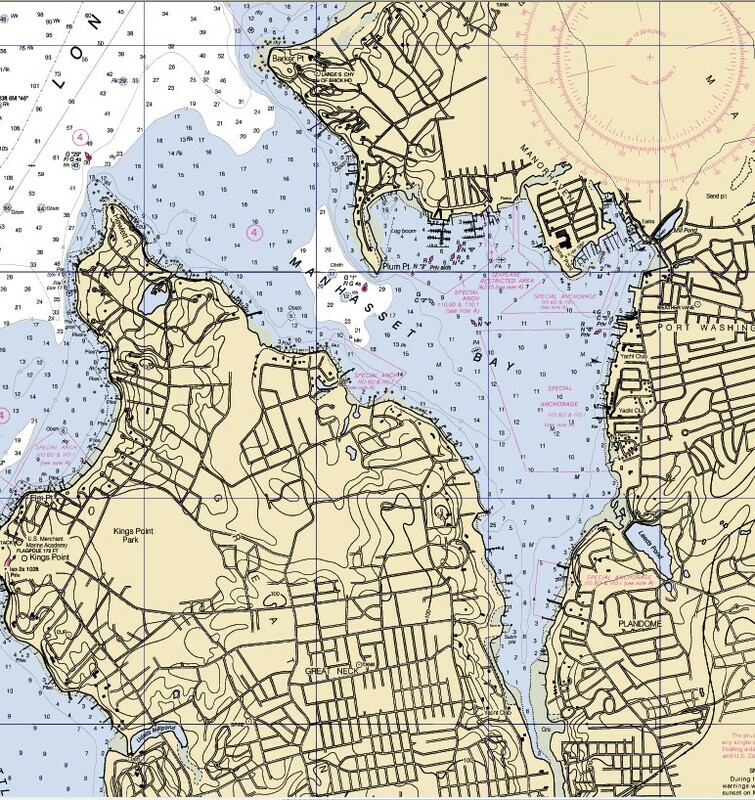 In contrast, Manhasset Bay at 15 feet MLW offers moorings galore, slips for every sized boat (except maybe Tiger Wood's yacht) and several nice anchorages. The anchorage between Plum and Tom's Points is accessible into town via dinghy yet clear of the main hubbub. On approaching Manhasset Ba y, boaters will either come from the West past Little Neck Bay, City Isla nd, and Hart Island or from the East and pass between Execution Rocks and Old Sands Point, where the distinctive 1809 brownstone tower of Old Sands Point Light stands. Between Sands Point and Barker Point lies Half Moon Beach, one of the best on the Sound. Take a lunch & swim detour here but don’t stay overnight. It is too exposed. Once past Plum Point, Manorhaven (a villlage that is part of the town of North Hempstead) is to port and Port Washington is almost straight ahead. The Bay turns to starboard and becomes narrower and shallower the farther in you go. There is a 7 foot tidal variation in this region so be sure to check the tides before anchoring. This is where the LIS contingent of Sail for America participants met up in September 2002. Scores of boats anchored in Manhasset Bay awaiting the morning transit down the East River. We were already in New York Harbor awaiting the fleet, having come down the day before to join the Around the World Racers coming in to Manhattan on their first leg. The flotilla from Manhasset Bay that passed under the Brooklyn Bridge was an amazing sight, and combined with boats from New Jersey passing under the Verrazano and those from upstate coming down under the George Washington Bridge. It was quite the lifting of spirits in New York that day (read our account of that day here). A stone's throw away from the Throg's Neck Bridge (top left) and the East River passage to New York City, Manhassett Bay is the perfect stopover for staging a transit to New York Harbor. The Eastern approach is guarded by Execution Light in the Sound (bottom left) and Sands Point Light (bottom right). Between Sand's Point and Barker Point (top right) is a lovely beach. The stately Manhasset Bay Yacht Club. Once called Cow Ba y , Manhasset is close enough to New York City to be a commuter’s mecca for those who love the water. Yachts clubs dot the shore, including the friendly Knickerbocker Yacht Club, the stately Manhasset Bay Yacht Club, the Port Washington Yacht Club , The North Shore Yacht Club and Broadlawn Harbor Yacht Club. Add to that the marinas  Manhasset Bay Shipyard (great for repairs), Manhasset Bay Marina (great for people watching) and Brewer's Capri  and you’ve got a great destination all on its own and an ideal staging area for transiting down the East River to Manhatta n.
Over three dozen restaurants and several hundred shops line the various main roadways in Port Washington. Numerous antique and collectibles stores and quaint gift shops can be found along lower Main Street, in the harbor area. The Chamber of Commerce offers a free directory of restaurants and merchants. (516-883-6566). Manhasset Bay Marina, a division of Guy LaMotta Boats, Inc., is home to La Motta’s Italian restaurant and host to the Manhasset Bay Gold Cup Races. Even for a sailor, it’s fun to visit the restaurant and marvel at the high power muscle boats parked there. Manhasset Bay Marina has 285 slips and can accommodate vessels to 100 feet in length. There is a Stop & Shop visible on shore right from the water if you need provisions. The same shopping center also has a Radio Shack, video rental, and hardware store. On approach, watch out for commuting sea planes and keep clear of the restricted area where they land. If you are dinghy touring, be sure to traverse the maze of docks and see the veritable city of house boats (or is it boat houses?) closer in to shore at almost every dock noth of the restaurant. It is quite fascinating. Louie's Restaurant with the bright red umbrellas offers transient dockage for dock & dine convenience. There are many fine restaurants in Manhasset Bay . A venerable institution is the cleat & eat Louie's right on the waterfront just to port of all the yacht clubs. Call ahead to see if their dock space for transients is available. The best way to orient yourself is to locate MBYC, the large brick structure smack in the middle of where it’s happening. Louie's is several buildings to port with the bright red umbrellas on the patio (Please don't change the color. The blue ones aren't very visible from the water!). The town dock is just to port of Louie's . Louie's used to be quite the sailor's hang out, with what seemed like generations of memorabilia and an eclectic layout. It was completely redone several years ago and now offers a relaxed but more upscale setting. The outdoor patio is great in good weather. It can get quite loud and the crowds on weekends can create waits in excess of one hour. Otherwise try Dynasty for awesome Chinese food just down the block from Louie's (on the side street where the ice cream parlor is), Bill's Harbor Inn for Steak and Seafood, Diwan for Indian, Fin MacCool’s for Irish pub fare and Pomodoro or Seaport on Main Street. If you start at yacht club row, walk past Louie's along Main Street which turns right at the town pier and park. Other choices include Brewer’s Capri and West Marinas at Inspiration Wharf, both of which have food on the grounds although we have not eaten there. Brewer's Capri is on the West side of the harbor as you enter and they have two restaurants, a pub, and chandlery as well. North of Brewer's is the town dock and boat launch for Manorhaven. There is not much there and only a 15 minute tie up allowance. Just a cab ride into town at the foot of the harbor on Northern Blvd/Rte 25A is the ultimate shopper’s paradise. Dubbed the “Miracle Mile”, this area is sure to delight the crew and lighten the wallets - substantially. One of the most glamorous shopping strips on the East Coast consists of major department stores and small specialty shops, including those at the Americana center (516-627-6700) that hosts such names as Gucci, Prada, Chanel, Jimmy Choo, Oscar de la Renta, Fendi, Dior, Armani, Burberry, Ferragamo, Cartier, Loiuis Vuitton, Van Cleef & Arpel and more than 40 other shops. Can you handle it? Pick a really hot day and go there to chill out! If you get tired of shopping and boating, try your hand at golf. With 18 golf courses within 5 miles of Port Washington, perhaps you will find some tee time available. Settled in 1674, residents made their living raising cattle and oyster farming until the 20th Century, when sand and gravel became the major industry. In fact, ninety percent of all the skyscrapers in New York City were made with Port Washington sand. Manhasset was named after the Manhansset tribe of Native Americans who occupied the area. Manhasset was once home to John Hay Whitney, founder of the Museum of Modern Art, and of course, the Gugenheims. Today, at Sands Point, the Gugenheim mansions have been preserved among a 209 acre forest. Castlegould, an Irish stone structure, is now a dinosaur exhibit. Falaise, a Norman-style manor has its original furnishings, and the Tudor style Hempstead House are available for scheduled tours. We took our bikes on a ride through the grounds. It was quite fun to see the different styles juxtaposed and wonder about the personalities that construed them. It is thought that F. Scott Fitzgerald used Sands Point as The Great Gatsby's West Egg. Lindberg spent time here after his transatlantic flight. In addition, "The Godfather" (1972), "Great Expectations" (1996) and "Scent of a Woman" (1992) are all films shot at Sands Point Preserve. And the Pan Am clippers left from Manhassett Bay on their romantic transatlantic sojourns. Dreaming about those glamorous days is a good passtime in Manhassett. So don't pass up that opportunity to stop here on your way to Manhattan. For a listing of restaurants, yacht clubs & marinas, golf courses and attractions, please click here.